Know more on best weather and climate conditions for traveling in India. The period between October to March is the ideal time to visit/travel India. Best Time to Visit India - India is a pleasure to visit during the cooler months between October and March. By then the heat of the summer is gone and tourism becomes an enjoyable affair. Rajasthan's dry and arid land is more bearable in the winter months. Around this time, however, the usually wet northeast, goes dry and is easier to travel to. The South, of course, is fascinating with the rain on the beaches. So the best time to travel India is between the months of October to March every year. Another reason to visit India during this season is the festivals celebration. Many of the famous fairs and festivals are celebrated are celebrated during this period. Dusshera, Durga Puja, Diwali, Pushkar camel fair and Goa Carnival are some of the major festivals of India celebrated between the months of October to March. You can see Indian people playing the colorful festival known as Holi in March. So traveling to India during the months of October to March is an incredible experience to explore richness of Indian culture. But if you are planning to visit India during the months of March to May, and then better prepare yourself for heat and humidity. It is advisable to visit scenic places and hill stations like Shimla and nainital during these months. 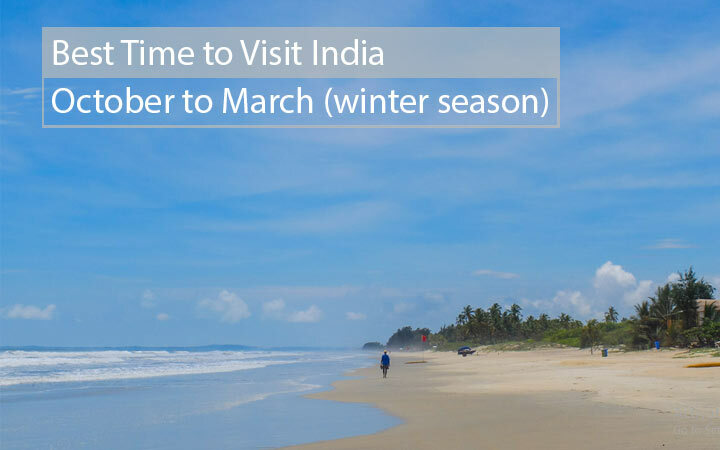 The best places to go in India during the winter months of October to March depend entirely on your choice. One can visit anywhere in India as the weather remains very pleasant during these season. However places like Delhi, Jaipur, Agra, Udaipur, Chennai, Goa, Hyderabad and others offer pleasant weather conditions for tourist in the months between October to March. Summer season in India is not an ideal time to travel there as the weather gets very hot and humid. Hill stations like Shimla, Nainital, Ooty, Manali and Corbett are some of the coolest places to visit in India during the summer months.